For the first time in the Baltic countries and neighbouring foreign countries! 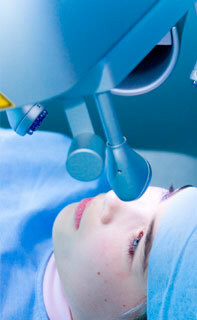 The operations are performed by use of microsurgery system Leica M841 EBS – it is a new era in ophthalmology, "cosmic" technology and know-how created by "Leica", world leader in optical and microsurgery system manufacturing. Microsurgery complex is equipped with new generation optics, OptiChrom system , apochromal system "ZOOM", an apochromal lens, not blinding "cool" white light (protecting eyes from influence of light during the surgery), four electromagnetic brakes and 100% stereo lenses and independent focusing for two surgeons simultaneously. offers a wide range of modern qualitative general and functional vision diagnostics performed by last generation equipment manufactured by the world leaders. Only state-of-art technologies guarantee precise diagnosis and subsequent correct treatment (therapeutic, laser, microsurgical). High-quality vision diagnostic enables the physician to be sure of diagnosis, to make a correct decision about the tactics of treatment, including indications for surgery and the choice of most suitable surgical method. 1. Microsurgical system Leica M841 EBS – Switzerland, "Leica", is among the best microsurgical system today. A specialized ophthalmological microsurgical system of new concept with apochromal system "ZOOM" and apochromal lens, with ultralow tubus for the assistant without the light separator, XY – equipment with motorised bend. - is equipped with new generation optics "OptoChrom"
2. Phacoemulsificator - reliable technology, minimal number of side effects, foreseeable result of the operation, speed and quality of operation performance, one of the most reliable equipments in cataract and implantation ophthalmosurgery. 3. Computer refractometry; computer keratometry (built-in 5,6 in colour monitor; widened measurement range; possibility to perform measurements with narrow pupil, minimal size of pupil 2,3 mm; possibility of measurements with implanted IOL; function of fast measurement enables performance of several measurements (from 1 to 10) with one press of button; automatic measurement of interpupillar distance). -autorefractometer/autokeratometer – Japan, "Shin-Nippon Accuref-K 9001"
4. Computer tonometry (measurement of intraocular pressure) – no need for contact method. The softest air impulse will make the process most comfortable the patient. Error is not possible as all the information about setup and measurement is given on the screen. The most modern technology – a guarantee for accuracy and reliability. The most progressive equipment for non-contact tonometry is created on the base of clinical experience of more than 27 years. Multiple clinical studies showed that measurements done by the equipment of company “Leica-Reichert” correspond to expert results of measurement by Goldman method (contact method). autotonometer-non contact - USA - Switzerland, "Leica/Reichert-AT 550"
5. Computer digital perimetry (examination of vision field in glaucoma, retinal pathology, optic nerve and neurology diseases. 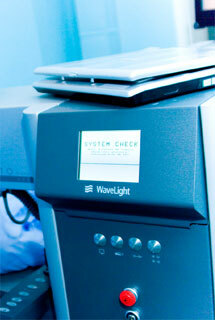 Contrast and threshold retinal sensitivity can be measured by this equipment. It is used for exact diagnostics of the disease type, its stage and, due to comparative programmes enables to track progression of the disease). · A–scanning (system of mono-measure image measures depth of anterior camera, thickness of the lens and internal eye membranes, as well as length of eye; the equipment contains all international formulas for calculations of the lens, necessary for operations). France, "Quantel Medical Axiss II"
· A-B–scanning (A-scanning see above; B-system double-measure image enables evaluation of corpus vitreous, to diagnose and evaluate height and prevalence of the vascular membrane and retinal detachment, to find and define localisation and size of eye and retrobulbar neoplasms, as well as to detect and define the foreign body placement; contains all the main formulas for the calculations of artificial lens). USA - Switzerland, "Alcon Ultrascan/Ultrasonik"
Japan", "Inami L–0240" with enlargement zoom from 10 to 30 times; Japan, "Takagi"; Japan "Nidek"
11. Computer tomography of retina and optic nerve Retina Tomograph HRT III - new "Golden standard" in glaucoma diagnostics Germany, "Heidelberg Engineering", see section "News" - diagnostic. USA, "Refractec" - Near Vision REFRACTEC ViewPointTM CK SYSTEM-new revolutionary technology for vision correction in nearsightedness and presbyopia (ageing farsightedness), see section "News". 13. 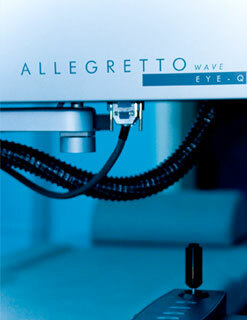 Excimer laser ALLEGRETTO WAVE EYE-Q - Germany, "WaveLight" AG see section "News". 16. ZYOPTIX XP Mikrokeratome - USA, "Bausch&Lomb"
17. Laser VITRA 532nm - France, "Quantel Meditec"